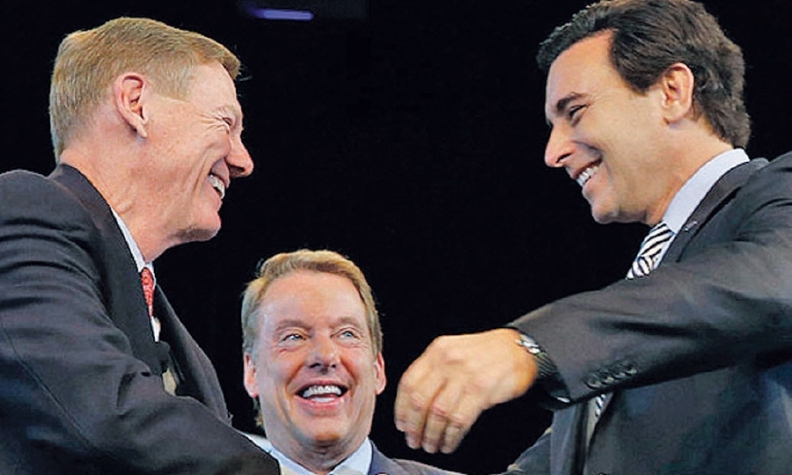 Former Ford CEO Alan Mulally, left, earned $22 million in 2014. Executive Chairman Bill Ford. center, received $15.1 million in compensation.CEO Mark Fields earned $18.6 million. Alan Mulally, who retired as Ford Motor Co.’s CEO in mid-2014, received compensation worth $22 million last year, the company said today in a regulatory filing. His successor, Mark Fields, earned $18.6 million. Mulally’s payout, which included $1 million in salary and $10.2 million in stock awards, brings his total compensation in eight years as CEO to $207.4 million, based on the figures Ford has reported in past filings. Fields, who took over as CEO on July 1, earned 83 percent more than in 2013, when he was COO. He received $1.7 million in salary, $3.4 million in stock awards, $6.2 million in options and $3.2 million in non-equity incentive plan compensation. Most of the rest was deferred compensation and changes in pension value. Neither Mulally nor Fields received a discretionary bonus. That’s the first time since 2009 that Ford did not give its CEO a bonus. Fields earned less than half of the $38 million in compensation given to Fiat Chrysler CEO Sergio Marchionne. General Motors has not disclosed final 2014 compensation figures for CEO Mary Barra but previously said she could earn about $14.4 million. Ford’s executive chairman, Bill Ford, received compensation worth $15.1 million last year, 26 percent more than 2013. He also did not receive a bonus for the first time since 2009. The company said it gave a $267,450 bonus to CFO Bob Shanks for guiding “a robust business planning process and execution of our business goals.” Joe Hinrichs, Ford’s president of the Americas, received a $135,000 bonus for overseeing the launch of 16 vehicles in North America. “While each of the Named Executives made a significant contribution towards the strong results achieved during 2014, the Committee determined that the performance of Messrs. Shanks and Hinrichs warranted recognition in the form of incremental bonuses,” Ford said in its proxy filing. Total compensation for 2014 was $6.3 million for Shanks and $6.1 million for Hinrichs. Fields took over as CEO during a year that saw Ford’s net income fall 56 percent, largely attributable to a flurry of product introductions around the world and economic woes in Europe and South America. U.S. market share fell 1 point to 14.9 percent in 2014. He has said 2015 will be a “breakthrough” year for the automaker as a result of the work done in 2014.